Just because an animal is big and fearsome to look at, doesn’t mean it can’t be damaged on the inside. The fact that thousands of wild animals are owned and abused all over the world is unacceptable. The fight continues against those who seek to keep exotic animals as home pets (creatures such as big cats and monkeys, for example), but it’s far from being won. Voodoo is a big cat, and it goes without saying he should never be kept in a cage. He’s suffered in life, sadly, with his previous owners trying to breed him. Not only that, but they declawed him as well, leaving him maimed and depressed as they tried to make their money. Fortunately, he was rescued by a group of animal heroes, and taken to a place where he’d no longer have to live in fear and pain. 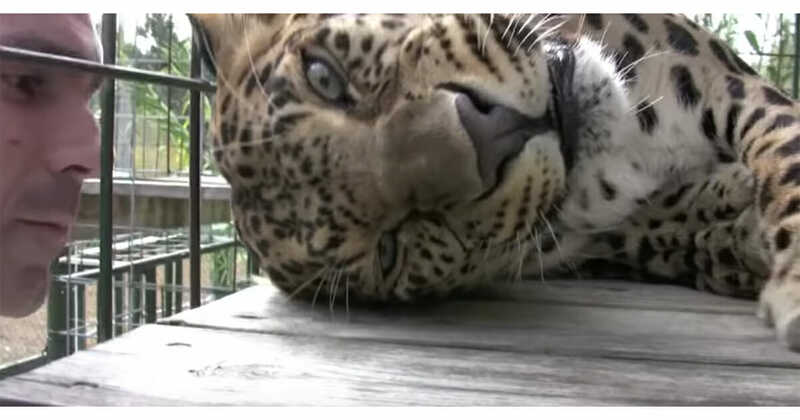 The wonderful team at Cedar Cove Tiger Park uploaded a video of Voodoo there, where one of there staff is actually able to put their hand inside the cage and rub him. Not only that, but it’s a gesture Voodoo certainly seems to respond well to. 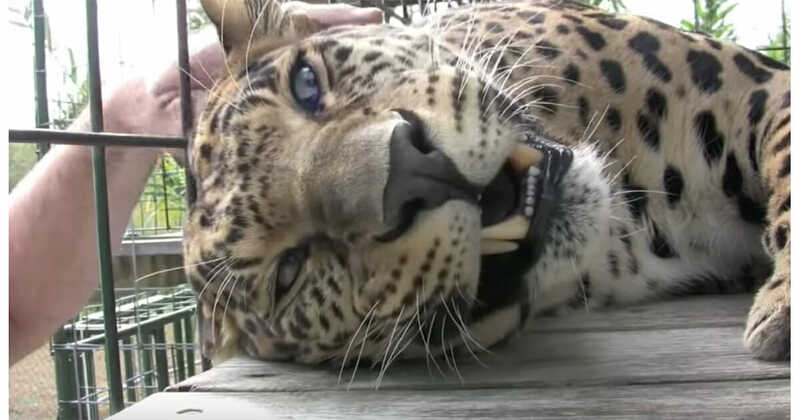 The giant leopard purrs in a way reminiscent of a house cat in front of a fire. It’s so great to see him truly content!